Behind the Bit: Check Back Oct. 18 for the BLING BROWBAND GIVEAWAY! Check Back Oct. 18 for the BLING BROWBAND GIVEAWAY! This is my browband, giveaway is for a custom band. Oh, and if you are a blogger and help promote the contest, you'll get $30 off a custom browband plus free shipping (total cost is under $75). Leave a comment and your blog URL you if you'd like to participate. I love the spacers and the little flower spacers on the side are a lovely detail. it's gorgeous! It would be so perfect on my dun cob!!! If I win I'll be shouting about it on thewanderlywagons.blogspot.com! That should look great on Riley. We need pics of him sporting it. Hi everyone! I am the browband designer. I'm excited to do this give-away. 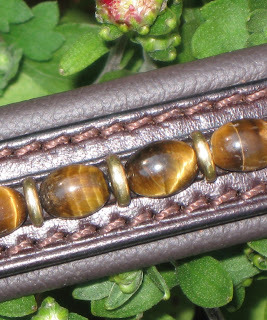 The picture is Stacey's browband, made from Tiger Eye stones. 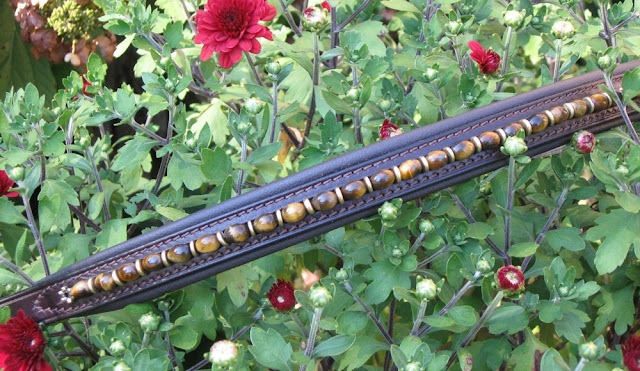 The winner of the contest will get to choose a custom browband from LOTS of stone and bead choices! Hi! I am the browband designer. I am very excited about this give-away. The browband in the picture was made specifically for Stacey's horse out of Tiger Eye stones. The winner of the contest will get to choose a custom design out of LOTS of stone and bead choices. would love to promote the contest on my new blog! That would look SO GORGEOUS on my tricolor paint mare - Wow. I might have to start a blog just to promote this contest to I can win! Kirsten, keep in mind that you can always just ENTER the contest :-). But I'm happy to start someone on the road to bloggerville too. Lovely pieces. Would love a blue one for my lovely, delicte Welsh-headed guy! I'd love to promote it! And would love to win THIS one! Oh how nice it would be on my appy!! The browband is beautiful. Count me in! Either one of my haffies would look elegant in a custom browband! Hey I know this is a bit off topic, but speaking of products...has anyone heard of the "Better Bucket"? It is supposed to be more accommodating for a horses facial structure and I am curious to see what other people think about it. You can go to the following link to check out a short video clip of it. Oh, my, is that ever stunning! I'll be happy to leave a shout-out over at mylifeasarider.blogspot.com! Beautiful! I would like to participate and I will promote it on my blog. I *love* blinged out browbands! It's so hard to find nice ones, especially on a budget. Fingers crossed I win! :) Thanks so much to KP and Stacey for this contest! How gorgeous is that??? I love it!